Styled with cohen pant wool and milo sweater . This longer version of the Robbie is tailored with 100% virgin wool — selected for its warmth and softness — from a premier Italian mill. An ultra-thin vegan suede interlining sewn into the back protects you from wind and cold without added bulk. This jacket fits larger. You will definitely need to go down one size. I could not as there weren't any sizes left. This jacket is one of the softest I have ever had but if you are short, I would not recommend this jacket. It will look so long. Received the coat in the mail and I do have to say it is beautiful. 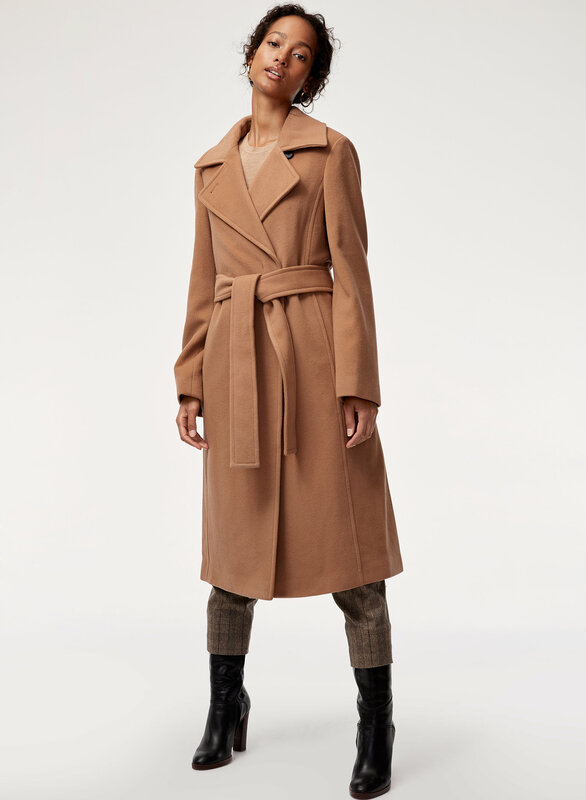 I love the craftsmanship, design and style but that goes with most Aritzia coats! It's thick, heavy and lined. I love the way it drapes without the belt tied. However, it was unfortunately a bit too big. I have a small frame, I'm 5'6", weigh 120 pounds, 24-25/XS-S waist and my bust is 34B. 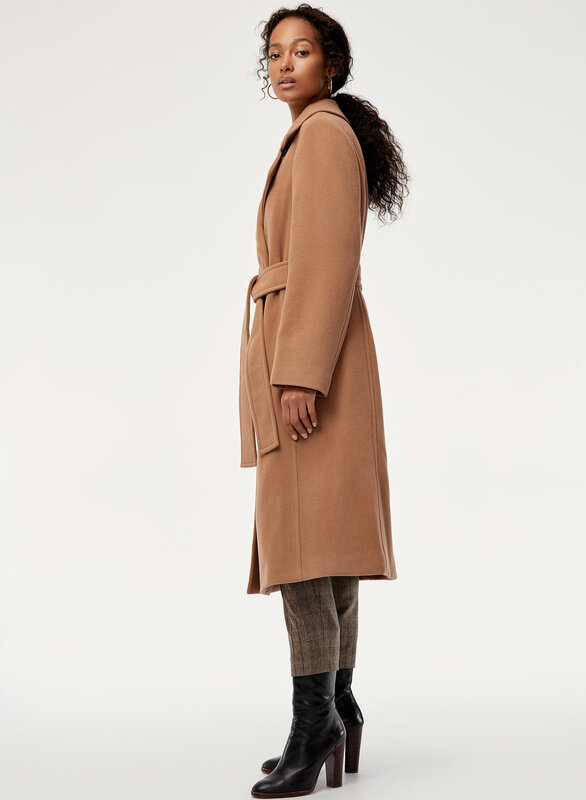 The coat reached right above my ankles which I did like, the slit in the back made the coat more soft looking and not too masculine. I felt there was so much extra room in the arms and noticed that it would gather around my shoulders which made it look awkward. Sadly, I had to return the coat but I did exchange it for the Joshua Coat. I was able to try on different coats in store and XXS seems to be my true size! 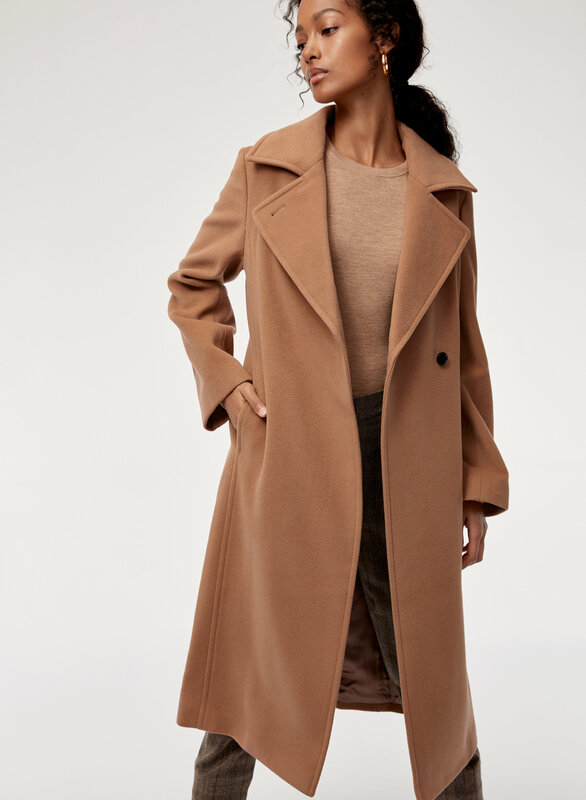 Have always wanted a long camel coat and this one ticks off all the boxes. Slightly oversized but just the way I like it...can wear a leather jacket or thick sweater underneath. I got this coat to replace my other Babaton coat (the arm tore for some reason). This one seemed perfect because of it's over-sized fit. I got a XXS, and the coat was a pretty large on me (arms are very long). The material is very soft and warm for cold days, however, I somewhat drown in the coat. In addition, after the second time wearing the coat, one of the strings that holds the tie for the waist broke. Since the string is so thin, I'm not even sure how to go about fixing it. The coat would be better if the strings to hold the belt were more supportive. 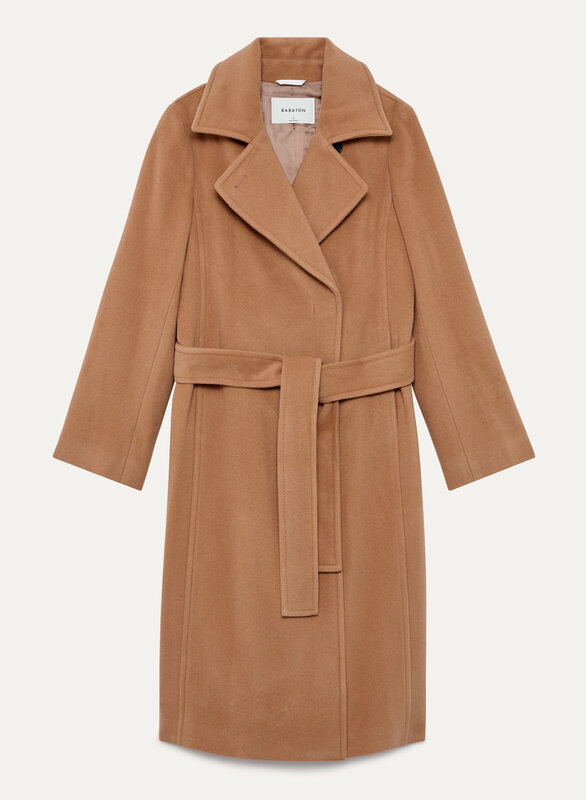 This coat is beautiful and is such a staple piece! It's warm, comfy, and has plenty of room so you can wear large sweaters or other coats underneath! It fits pretty true to size but runs slightly larger. I'm 5'5 & 120lbs and ordered the camel color in XS. I kind of wish I ordered the XXS but it still looks great! The sleeves are VERY long but I brought it to get tailored and now it looks perfect! Highly recommend this coat. I got this in the camel colour and love it! The fit is perfect for me, the length is mid-calf but I wanted it this length for warmth and so I can wear my midi skirts. The only thing that isn't perfect are the sleeves; bit too long hence the 4 rating. The material is nice and soft. A Meagan Markle kind of look.... classic and modern. This is my first time buying anything from Aritzia and I am so happy this purchase worked out for me. I have a small chest and narrow shoulders. I usually wear tops in XS or S, and I was going back and forth between ordering XXS or XS in this coat. I decided to go for XS and this coat fits really well. 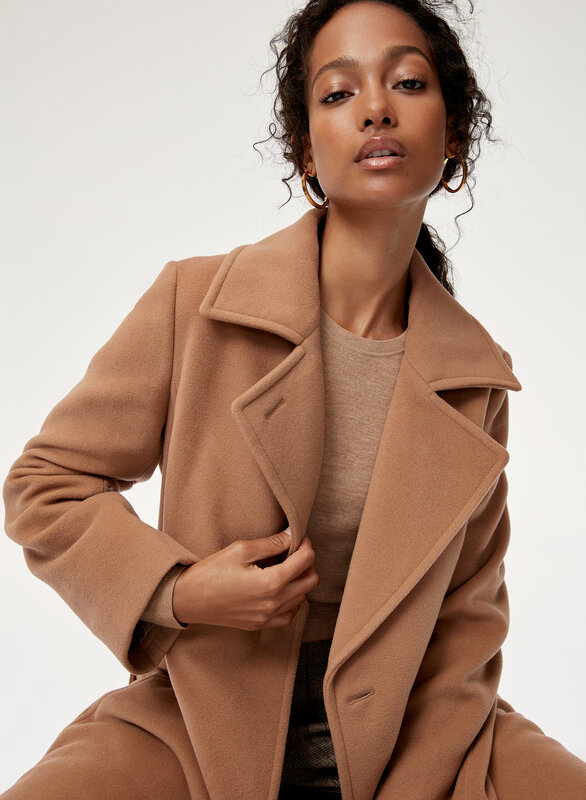 However, when I wear chunky sweaters underneath, I look a little bulky in the shoulders so I tend to not wear this coat when I wear thicker sweaters. I really love the camel color, I have gotten so many compliments on it. The coat makes you look really dressed up and chic. My only issue with it is the buttoning, it takes some getting use to but it's still a great coat. I also really like that it goes past my knees because it keeps my legs covered. Worth every single penny in my opinion, especially since it's 100% virgin Italian wool. You will not be disappointed with the quality of the material with this coat. Beautiful coat! Excellent quality, fit and style! Love the grey! I was struggling to decide between the XS and the S, and ended up going with the S. The XS fit very nicely, but was a bit short in the arms when I lifted them up. I'm also not sure it would have fit comfortably with a bigger sweater under it. The S is perfect for me. It has a bit of an oversized look to it, which I decided I liked. I can fit big sweaters under it, and there is plenty of length in the arms. My only complaint about this mule are the strings that hold the waist wrap. They seem too thin almost, as if they could break easily. I am nervous to keep the jacket 'open' and let the waist wrap drag, so I make a conscious effort to wrap it around my waist, so as to not let the strings on the coat break/snag. But overall, I am very pleased with this jacket, and I know it will last forever. Thanks Aritzia!